The Full Circle Youth Empowerment Center recently opened on East Main Street with a mission to support those ages 14 to 20 with the skills necessary to transition into adulthood. Connecticut is ranked fourth in the nation for children in foster care out-of-home placements. As a result, a high percentage of these youth experience low educational and career attainment, early parenthood, substance abuse, physical and mental illness, and incarceration. Full Circle Youth Empowerment offers a direct response to this issue by empowering youth to become self-sufficient despite their challenges. Full Circle Youth Empowerment is a team of highly trained professionals who believe in the resiliency of our youth who have therapeutic needs and have experienced many adversities in life. They strongly believe that with specialized services, the commitment of families, and the collaboration with community providers, Bridgeport’s youth will receive the necessary supports to overcome challenges, improve their outcomes, and successfully transition into adults. Full Circle Youth Empowerment is fostering hope and empowering lives along their journey. They are building a community for youth to flourish. I hope you will join me. Please visit the center’s website at www.fcyecenter.org to learn more. 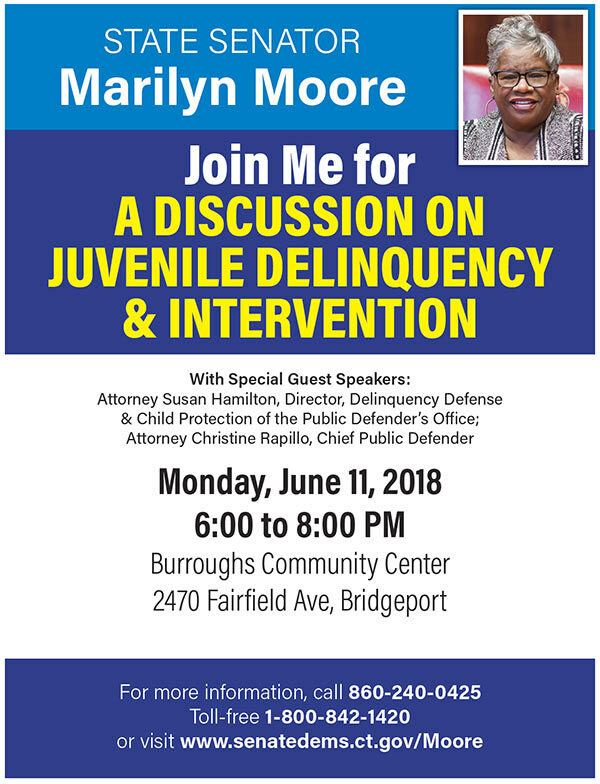 I’ll be hosting “A Discussion on Juvenile Delinquency & Intervention” on Monday, June 11 from 6 p.m. to 8 p.m. at the Burroughs Community Center, 2470 Fairfield Ave, Bridgeport. I decided to host this community conversation after hearing from various constituents—including a group of mothers from Bridgeport who have been affected by gun violence—about their concerns regarding the youth in our city. This forum will allow all of us to express our opinions and learn more about what’s currently happening in the juvenile judicial system from attorneys who are working with youth every day. From there, we can move forward with determining policies to fight for at the state level to address the issues surrounding juvenile delinquency in our community. I’ve invited Attorney Susan Hamilton, Director of Delinquency Defense & Child Protection of the Public Defender’s Office, and Attorney Christine Rapillo, Chief Public Defender, to participate in the discussion. This event is free and open to the public. For more information, call my office at 860-240-0425 (Toll-free 1-800-842-1420) or visit www.SenatorMoore.cga.ct.gov. My annual Trumbull Integrity Awards will be held on Friday, June 15 at 6 p.m. at Trumbull Town Hall, 5866 Main Street, Trumbull. A person of integrity personifies a state of incorruptibility, soundness, and completeness. Throughout the town of Trumbull, this is a quality that resonates in our residents. This award, which I present each year, identifies and honors individuals whose integrity stands out in their community and echoes throughout. This year, the award will be presented to Madison Silva, Heather LeMoult, and John Vazzano.